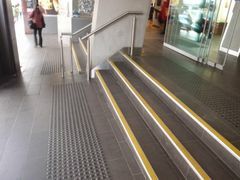 Disability access legislation and Australian Building Code require public buildings to comply with AS 1428.1 Design for access and mobility – General requirements for access – New building work. 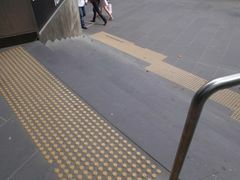 AS 1428.1 identifies that visually impaired people require warning signs for hazards when wayfinding through public premises. 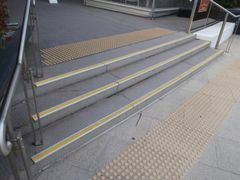 These signs are tactile whereby visually impaired people can feel through their feet or visual aids and are known as Tactile Ground Surface Indicators or TGSI’s for short. 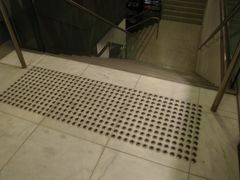 There are requirements which determine the size shape and colour as outlined within AS/NZS 1428.4:2009 Design for access and mobility – Part 4.1: Means to assist the orientation of people with vision impairment Tactile ground surface indicator. One important aspect of TGSI’s is to provide luminance contrast. Luminance contrast is a measure of the difference of light reflected back from a light source in cd/m2 or in Y when compared against CIE 1931 color space chromaticity diagram using xXY coordinates. TGSI’s serve to inform visually impaired people of either information to direct people to a point of interest (directional TGSI’s), or to warn people of a hazard (warning TGSI). Directional TGSI’s are long bars indicating a direction of travel and warning TGSI’s are small dots or bumps. The correction dimensions and location in relation to the hazard is critical to ensure safe wayfinding for visually impaired people and consistent information and feedback to make the correct informed decisions required to be made. 3) Composite discrete TGSI’s are similar to discrete with the exception that the truncated sides of the domes or the directional markers are a different colour to the upper surface. 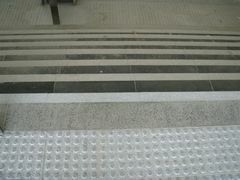 The composite discrete TGSI is generally manufactured this way to incorporate a superior slip resistant surface. The formula for luminance contrast for TGSI’s is calculated in accordance with Australian Standard AS 1428.4 and is dependent on the method of testing (i.e. lab test method or onsite test method). The design stage is the most cost effective time to determine compliance. For new buildings, obtain the laboratory based measurements of luminance reflectance from the product supplier, or provide samples to Safe Environments for testing. The luminance contrast between the adjacent surfaces can then be calculated and then compared against the requirements of 30%, 45% or 60% percent depending on the type of TGSI. For existing surface upgrading for compliance with AS 1428.1 and AS 1428.4, luminance reflectance testing using the lab based method is recommended onsite to then compare against published values of TGSI manufacturers and installers. Additionally testing may also be required at this stage using the onsite method to determine compliance of luminance contrast under the prevailing natural and artificial lighting conditions. Spot checks of compliance can be done onsite as a reference check for further measurements being undertaken. Lighting surveys are also recommended to ensure there is sufficient lighting. Lack of suitable luminance contrast of TGSI’s may be due to a combination of complex interacting factors including lighting conditions, cleaning & maintenance, water absorption, sealants, soiling, fading and UV degradation, as well as incorrect initial selection. Safe Environments provide luminance contrast testing in Sydney, Melbourne, Brisbane, Canberra, Perth, Adelaide, Hobart and Darwin. Safe Environments use calibrated instruments by NATA accredited laboratories to ensure accuracy and reliability of results. Our consultants range a broad range of expertise in materials science, building surveying, disability access, ergonomics and occupational hygiene.